Michelle Says President Getting "Sports Stuff"
President Barack Obama is getting "sports stuff" for Christmas. But the president, an avid golfer and basketball player, will have to wait until Friday to find out exactly what it is. First lady Michelle Obama gave away that hint Tuesday during a trip to the Children's National Medical Center. She visited privately with young patients in the heart and kidney unit, then came downstairs to the atrium to read "'Twas the Night Before Christmas" to dozens more. Daughters Malia, 11, and Sasha, 8, helped their mother deliver that dose of holiday cheer, along with family dog Bo, who sported a red-and-white collar with sleigh bells. They walked him around to meet many of the sick children. A hospital worker followed closely behind offering squirts of anti-bacterial lotion to anyone who had petted Bo. The sisters also took turns reading "Snowmen at Night," which is about what those frozen figures do after dark. Then came questions from the audience, which included numerous apron-clad hospital volunteers and staffers, and relatives of the children. Dozens of other workers peered down on the scene through windows on the floors above. Neither Malia nor Sasha shied away from answering questions. They are often seen at White House events with either or both of their parents, but Tuesday's appearance was their first time speaking so extensively in public. What's Under the President's Tree? 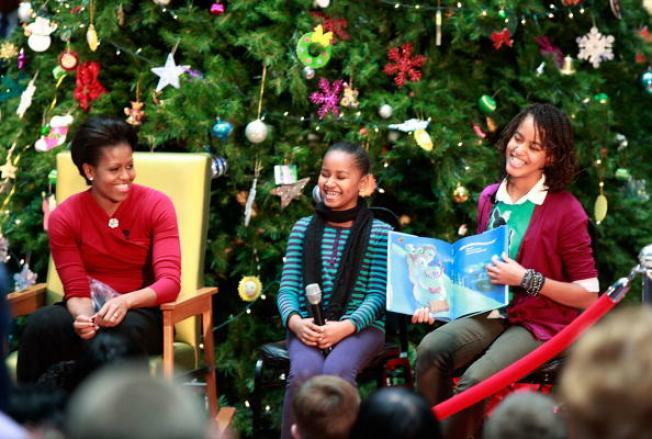 While visiting at the Children's National Medical Center, First Lady Michelle Obama and her daughters Malia and Sasha drop some hints about what they got the President for Christmas. One child wanted to know what the president would be getting for Christmas. Mrs. Obama at first joked that she couldn't talk about her husband's present because people would tell, but she relented and said, "It's good. I got him sports stuff." Sasha started to say what she and her sister got him, but the first lady interrupted. "It's something he likes," Sasha said. Earlier Tuesday, however, the president said in a radio interview that he and the first lady decided several years ago not to buy each other presents. He said the only Christmas presents he needs from his daughters are hugs. Another child asked how the holiday will be different for the Obamas. It's their first Christmas in the White House. "It will be easier to get on the plane," said Sasha, drawing laughs from grown-ups in the audience familiar with the difficulties of commercial air travel. Sasha now travels on Air Force One, the plush and spacious presidential plane. 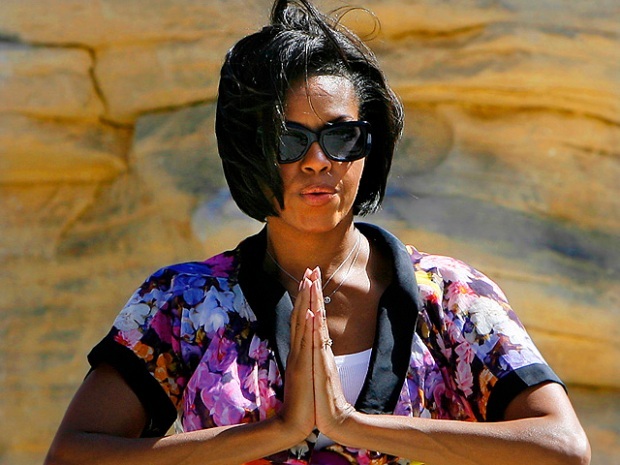 Mrs. Obama said the family planned to do what it has done for many years and head to Hawaii with a group of friends to celebrate the holidays. The president was born on the island and lived there as a child. "As soon as all the work here is done, we'll go there," she said. Obama said Tuesday that he wouldn't go on vacation until the Senate completes its work on the health care bill, even if that means staying in town for Christmas Eve. That's when senators are expected to pass their version of the bill. One difference for the Obamas this holiday is the number of Christmas trees in their new house. Mrs. Obama first guessed 24 after a third child asked how many, then an aide whispered that the correct number was 26 trees. 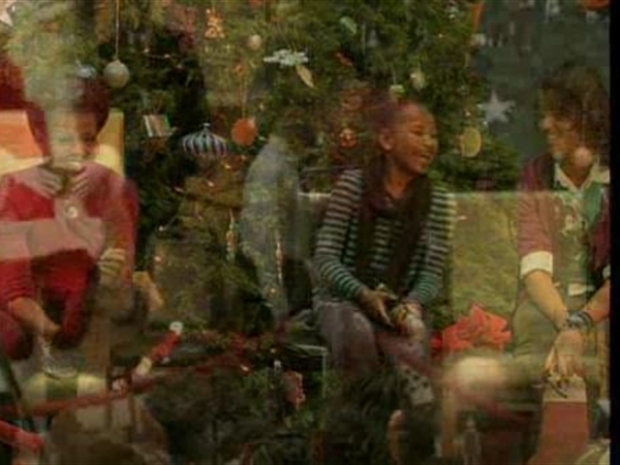 "Unfortunately, you don't get presents under all of them," Malia joked. Mrs. Obama's visit to the children's hospital continued a tradition of first ladies that dates to Bess Truman. Mrs. Obama also gave out frosted cookies in the shape of Christmas trees and dog Bo to the children.